CITE360studio and pmgm architecture teamed up to enter the Waskimo Hole-ympic Outhouse Races on Family Day. 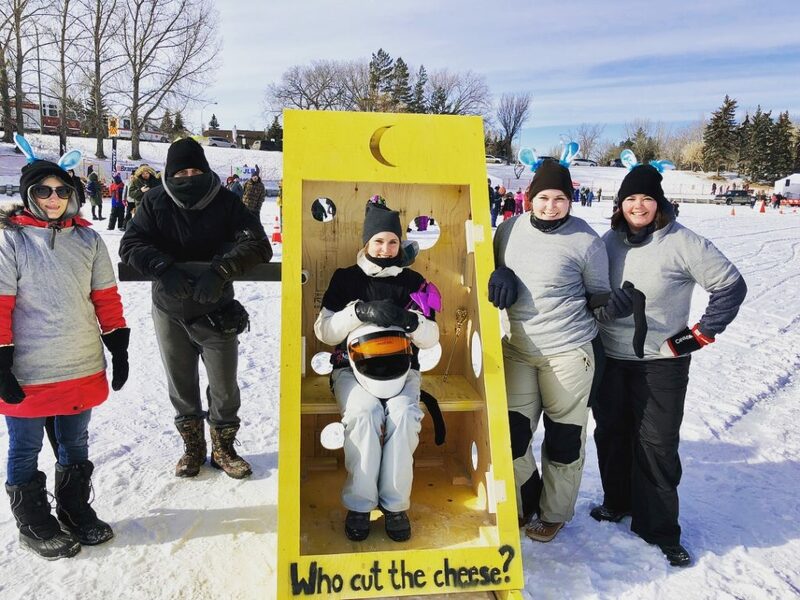 Our two firms worked together to come up with a creative design, produce the drawings, build the outhouse, and race against the other teams on Wascana Lake in Regina. Our team name was “Who Cut the Cheese?” and our outhouse was designed to look like a block of cheese with a knife slicing through. The racers dressed up as mice, with the Queen Mouse -and birthday girl- sitting on the toilet throne. While we may not have won the toilet paper trophy, we loved seeing the reactions to our design and putting smiles on people’s faces. Too ‘cheesy’? We really mean it though. We would like to send out a huge thank you to the race organizers and volunteers at Waskimo 2018 – we truly had a blast. The racers from left to right: Andrea, Tayler, Megan, Seanna, and Briana.